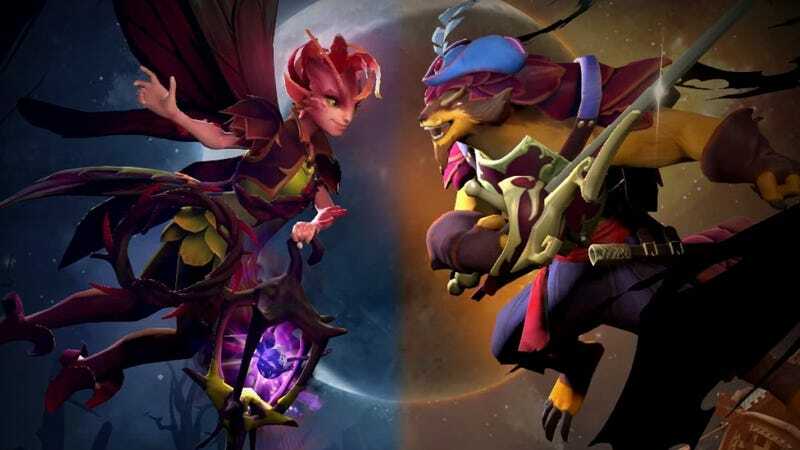 The Dueling Fates update hit Dota 2 last week after a long waiting period, bringing two new heroes, several new items, map changes, and new abilities and talents; in a week’s time, it’s already been updated, from 7.07 to 7.07b. Patches are nothing new in today’s landscape, but Dota 2 patches are particularly unique. While small balance adjustments try to even the scales throughout the year, every four to six months or so there’s a pillar update—a major overhaul to the game. Whether it’s a new hero, or a new gameplay mechanic, or any number of adjustments to the game, the way Dota 2 is played is changed on a semi-regular basis. These patches elicit fervor from the Dota fanatics, myself included. The second the patch notes went live, 24 hours before the patch itself, I was poring over details, my eyes darting from line to line, trying to formulate what the new Dota 2 would look like. Analysts and pro players smarter than myself have been tearing apart the granular details, looking for what enigmatic Dota 2 developer IceFrog intends to change within the game. One of my favorite analysts, Purge, recorded a ten-hour video going over every change. Ten hours. I’m listening to it right now, writing while he explains how the movement of a shrine or a change to the Glyph of Fortification affects pushing situations. Patches are meant to fix some imbalance of equality and make sure that all options are viable in competitive play. They also have another aim: to update the game and make it feel fresh again. The NFL might bump the PAT line back to encourage more two-point conversions, but they’re not altering the geography of the field to make kickers obsolete in favor of an entirely new position. It’s endemic to the way these competitions are played. Virtual games have limits and structures, physics systems that are determined by less human error than a football hurtling through the air. The wind won’t slightly alter the direction of Mirana’s arrows, so when that arrow becomes too powerful of a tool, the only way for a balance team to keep that in check is to encourage players to alter their playstyle. In esports, the jargon is “buffing” (strengthening) or “nerfing” (weakening). So if Mirana’s arrows get too useful, IceFrog, the developer, would either buff heroes that have long-range stun tools or just nerf Mirana’s arrow-shooting ability. ﻿It can be like learning a language and struggling to string together nouns and verbs until one day, you hear a sentence and you can speak and understand again. These patches change the definition of what Dota is, in the here and now. The format is still the same, the buttons and combinations familiar, but now there are different means to the same end. Your favorite hero isn’t up to snuff because their abilities were too powerful, so you have to find a new mainstay. A new item is dominating the metagame, and so you need to prepare to deal with that tool. It’s just a hair shy of being a new game again, and there’s excitement in the feeling of constant discovery. It can be like learning a language and struggling to string together nouns and verbs until one day, you hear a sentence and you can speak and understand again. Amid the hype for patch 7.07, there was one voice of slight dissent. Team Secret’s coach Lee “SunBhie” Jeong-Jae wrote a blog post where he posed a simple question: Why are patches needed? In it, he discusses the differences between sports and competitive gaming, as well as other popular games that went without patches for a long time, like Brood War or Super Smash Bros. Melee. He also raises the interesting viewpoint of how patching can affect professional teams like Team Secret. For competitive players, though, patches can be a scary thing. In 2013, European Dota squad Alliance was dominant The International, the biggest annual Dota championship, finding huge success with their own unique strategy. Their team would split into units, which put pressure on opposite sides of the map and divided their opponents’ attention. Mix in some heroes who could thrive in late-game scenarios and support rotations that ensured their team gold average was always high, and it was hard for competitors to keep up with their ideal of play. It was a strategy referred to as “rat Dota” by its detractors, but it worked, and secured them the win in the grand finals. When the next patch came, many of the heroes that made this strategy possible, like Nature’s Prophet and Wisp, were tuned back down after the tournament. Alliance’s unique innovation, not starving out supports for certain players to hoard gold and moving around the map with pressure, was made both less unique and less effective. Combine that with the spotlight brought on from winning an International, and suddenly Alliance was in a slump so bad, they fell out of the top ten at the next International. ﻿While patches serve to balance and engage, they might also try to make me more likely to keep coming back, whether it’s healthy for the game or not. Like in traditional sports, many balance changes are made with an eye to improving the experience for both the viewer and the participants. Broadly, patches exist to serve two groups: the people who want to play a fresh version of a game, and the companies who want people to play their game and potentially spend money on it. Sometimes, these things can exist in harmony. I’ll be the first to admit that I’ve spent a fair amount of change on in-game cosmetics in Dota 2, and thankfully, none of those come with any gameplay advantage. I just get to look good while playing Dota 2, and send some money to a developer whose game I’ve spent over 3000 hours playing for free. With the most recent patch, as I’ve played game after game of Dota 2 trying to unravel what new horizons IceFrog has laid out for the competitive scene, I can’t help but wonder whether some of these changes were necessary. Did certain heroes really needed to be buffed so much, or given such ridiculous abilities? It’s incredible as a player, but I wonder if the true purpose is to grow the audience in a year where there’s many more major tournaments to show Dota 2 to the world. I’m not convinced that this is the case yet. While patches serve to balance and engage, they might also try to make me more likely to keep coming back, whether it’s healthy for the game or not.